All stays have a checkout cleaning fee of $135. Stays of more than 12 days have additional mandatory interim cleaning fees of $135. For example, if you had reserved the condo for 14 days, there would be one interim cleaning 1/2 through your stay, as well as the checkout cleaning after you checkout. Pros: Location was excellent with gorgeous views,Waikiki a short walk to the east, Ala Moana park a short walk to the west. Price. Very friendly management. Cons: Parking was very expensive and not disclosed until after we paid for the condo. Lanai was very small. The expansive views at the Ilikai Marina Unit 1592 awaits you from almost anywhere in the unit. A set of sliding glass doors open onto the intimate lanai which gives you an unobstructed view of the yacht harbor and a breath taking view of Pacific Ocean. This is a rare view in vibrant Honolulu. Enjoy a fireworks display from the lanai every Friday night. The dining area at the Ilikai Marina Unit 1592 has gorgeous ocean views. The kitchen at the Ilikai Marina Unit 1592 has been completely renovated. It is equipped for serving a light snack or cooking a gourmet meal. Open the door and walk into a condo that faces the beautiful Pacific Ocean. The bedroom at the Ilikai Marina Unit 1592 closes off completely from the living room with a sliding door. It has a Queen size bed that you can lie in and enjoy the ocean views. The bathroom at the Ilikai Marina Unit 1592 has a separate vanity area for grooming. The bathroom can be accessed from either the living room or the bedroom. There is a full tub and shower. Great service from Aloha Condos. We return to the islands at least 3 to 5 times a year and always try to book through Aloha Condos. They have a great selection of units and price ranges and they are well run and professional. Aloha until next time. Condo 1592 was what we hoped for. Lovely view of the ocean and local marina. It is safe, comfortable and well appointed. Ilikai Marina is centrally located next to Waikiki with an ABC Store and dining on the same block. Fairly easy access to the freeways if you want to explore Oahu. The reservation process went smoothly. Directions to the property and instructions for access to the unit were complete and easy to follow. We found the unit well prepared for our arrival. The kitchen is complete. TV and WIFI worked well. The bed was comfortable and the A/C worked well. Nice breeze when the lanai door is opened. We met friendly permanent residents and short term renters. If driving, park on the 6th floor of the garage for easy elevator access. And to save some money be sure to pay for parking for the entire length of your stay. Use Uber or Lyft for short trips to avoid parking fees.All in all a good value. We'll look to alohacondos.com for accommodations on our next visit to the islands. We came just to stop, relax, and have some time out, and this condo allowed us to do exactly that. As soon as we opened the door, the views were breathtaking, and we raced to snap some photos to send back home. The walk to Ala Moana was easy, as with spending time at the Beach park and Lagoon. We caught the trolley into Waikiki from outside the hotel next door, and having ABC so close allowed us to top up on anything we had missed. The full size refrigerator and freezer meant we could easily go to the supermarket and stock up for our meals for the week, as well as the full size oven and microwave. The couch was very comfy, and there were so many tv channel options, with strong internet service. It was just an absolute delight and we are very grateful to have had the chance to stay. Will definitely come again (hopefully soon!). We spent the week before our wedding in this great condo. The view was incredible, to say the least. The location was perfect. Just a short 10 minute walk into the heart of Waikiki, and if you didn’t feel like taking that walk, there were several great restaurants within a 2 block distance. Perfect view of the Friday night fireworks display at the Hilton Hawaiian Village every Friday night. Very clean unit and comfortable bed. Would stay here again in a heartbeat! My boyfriend and I stayed two nights in this condo and loved every minute of it. It is a spacious condo with a view of the marina and the ocean. From the balcony you can also see breathtaking sunsets over the mountains. There is a convenience store in the hotel next door we used (5-10 minute walk) and there’s an ABC store across the street; the beach is also a 5-10 minute walk away. I highly recommend this condo! Great place. Everything you need for an awesome stay. We will definitely be back. We enjoyed our one week stay in the condo it was clean and comfortable. Everything was provided including the outdoor equipment. Watching the stunning sunset and the gorgeous view of the Marina and the Pacific ocean was so relaxing. The bathroom needs to be upgraded but overall it gets the job done. Great place and great location, we definitely come back soon. 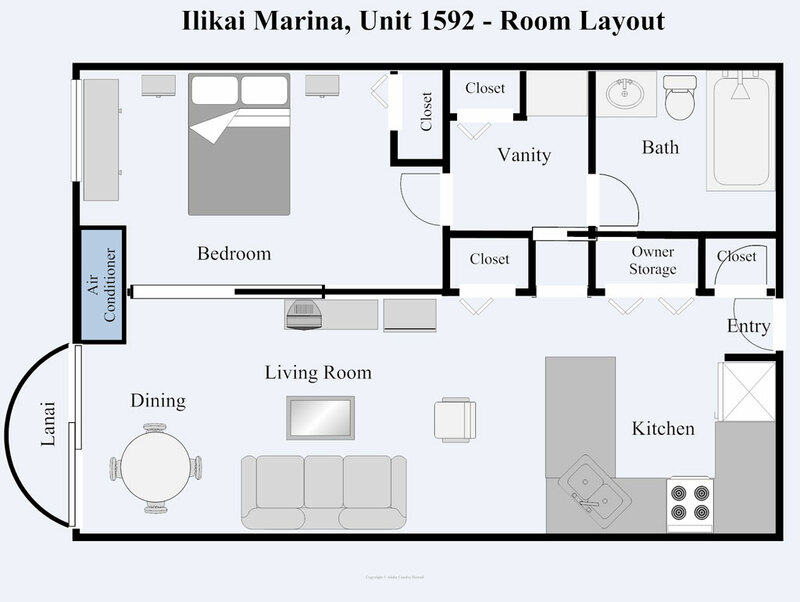 Thank you for your review for unit 1592 at the Ilikai Marina. We are so glad you enjoyed your sta and found it to be clean and comfortable. The views are amazing and the location is great! The upgrades would most likely increase the very reasonable pricing but thank you for the feedback. We do hope you can come again soon! Cool location had fun, place was clean, little dated, but all good and comfortable. Great view! Awsome fireworks show on Friday! Very convenient to the airport and the Waikiki area. Excellent view. Amazing place to stay. place was clean and had an amazing view. Would certainly stay here again!!! The condo was clean & comfortable. Well located to shops & attractions. Great views over the marina & the sunsets were spectacular. Thank you for taking the time to post a review. This condo is in a great location and we are so happy that you enjoyed the amazing views! We do try to have the guest arrive to a clean and comfortable unit. We do hope you can return! Great little condo. Only thing we can make a comment about is update the bedding a coat of paint and new outdoor stairs and it would be a 5 out of 5. Wonderful view and nice walk into town. Very good kitchen had absolutely everything in it. Staff below very helpful even took us up to our room on arrival and got a taxi for us to the airport on leaving. Would stay there again and recommend friends. Very good value for money. We appreciate your feedback and will let the owners know about your advise. The sheets have just been purchased most recently. We also will take a look at the paint and let the owner know what you have said. We are not sure what steps you are speaking about as there are no outdoor stairs at this unit as it is a high rise building. Perhaps you have gotten places you have stayed within the same vacation mixed up. We also do not have a staff at the complex other than the housekeepers which are contractors who are not there on going. We do have an on island contact for your needs or we are available to call for any concerns. I do believe you might be speaking about another unit. This review does not seem to cooralate to the unit at the Ilikai Marina. 1. The entire unit clearly needs updating or at least some touch-up, especially in the bathroom. The pictures on the Web site looked so much better and misleading to say the least.2. The bathroom felt filthy, especially the shelf under the sink and the tub area.3. The sofa looks good from outside, but the mattress inside was in a pretty bad condition. There is no way that I would sleep on that thing. 4. All the towels and sheets inside the old shelf near the entrance smelled funny so we had to wash them first.5. Water was shut down one day without any notice form the agent.6. We received a notice that hot water would be shut down for two days (one day before). We understand that this kind of stuff sometimes happen at old buildings in Honolulu. But, two days without hot water would make things a lot harder. I emailed Aloha Condos for suggestions on shower situation etc. However, I did not receive any response until the shut-down was over 2 days later. It seems that the owner has no love for this place, which is sad… Aloha Condos also fell short on some incidents this time. It was disappointing experience overall.I will probably use the Aloha Condos again for good past experiences, but I will never choose this unit again unless it is remodeled. Thank you for your review from your stay at the Ilikai Marina unit 1592. These units are individually owned which comes with each owners individual tastes and decor and each guest can have an opinion as to what meets their own individual taste with finishes. Our website does show multiple pictures of the exact condo and each guest can determine if the unit is a right fit for them. We understand that you felt the bathroom could have been cleaner. We do wish you would have called us about this during your stay so that we could have sent someone by to remedy whatever your issues were. We do respond immediately to our guests request just as before your arrival you had asked for extra towels to use as pillows which we communiticated your needs and made sure you were accommodated beyond the normal supply. Unlike a hotel, there are not carts of towels in close proximidy. If you felt the sheets on the shelf needed to be freshened up, just with a call we could have also taken care of that. Thank you for mentioning the sofa looked good and we will access the mattress and let the owner know if it might need replacing. The Ilikai Marina did have some emergency water shut downs during your stay which are completely out of our control or anybodies. It is just an unfortunate thing as with any property that system do fail and break. The Ilikai Marina does not notify us but they do post throughout the property in multiple places when they have an issue like this and is for sure seen by all who enter. We did not know about the first one day shut down but we did give you a notice when we heard about the second one and emailed you that day as soon as we knew. This emergency shut down involved the Circulating Pump Impeller Stack which had broken. We did get your email asking for suggestions about the hot water shut down but it was after the fact which was confusing. The water had already been restored when you sent that email so we did respond right away to your email reconfirming that the water was restored and there should not be any further problems. As a property management company we do want to respond to our guests in all of their needs but we do ask that you contact us so that we can remedy any situation that might be of concern. We are here to help. We stayed in this condo for 7 nights without a problem. 4 adults slept comfortably and the condo was very roomy. The separate kitchen was a bonus and the view was exceptional. We rose to beautiful views across the marina and lagoon and further out across the beaches. The location is fabulous as bus stops, taxis etc are just outside or around the corner. Red Lobster is at the bottom of the condos so a most convenient place to eat with great food and service. It is a ten minute walk to Aloa Moana shopping centre and a fifteen minute walk to the heart of waikikki to go to do some more shopping and go to many restaurants. Overall I recommend the aloha condos and this specific one was clean and tidy and very practical. Cant fault anything about it. Mahalo. Thank you for the great rating of 5! This condo is in a great location close to bus stops, restaurants, shopping and activities. The beach is also very convenient! As you mentioned the views are amazing too! Thanks for noting the unit was clean and also practical. This is such a great option for any vacation! Views are exceptional, location is great, the bed is good and its quiet and clean. It is not new and luxurious but everything in this condo is clean and works. Would recommend to anyone. Thank you for taking the time to post a response to our request for a review. Thank you for noting the great location, the exceptional views and a clean condo. The unit does have everything you need including a full kitchen and for the rate, it is an exceptional price and affordable. Thank you for your recommendations. Our family really enjoyed our stay at Ilikai Marina! It's a great and convenient location away from the hustle and bustle of Waikiki but still close enough to everything. We really like the view of the marina especially the Friday night fireworks. The instructions to the condo and which floors to park are very helpful since we have a little one with a stroller. When they ask you to park on the 6 or 7th floor, look to park at Level I (as in "i") or J. You can't see the numbers inside the parking lot, just letters. The unit is in excellent location, fabulous view. Inside smelled moldy and old. 10" tv and old furniture didn't match what it offered for location. Overall we had a relaxing time. Be careful for mite or tick! The view from lanai was wonderful for sunset.But there were mite or tick in the bed.My wife and I had rash and itchy terribly during our stay and not be cured yet. We'll not use this condo again. Thank you for your post and your concern, however all our beds are bed bug protected. We have had no cases at all and we have had the mattresses inspected thoroughly. Quite often when guests arrive on island, some more than others, they get bites from mosquitos and or sand fleas from the beaches which sound like what might have happened to you. Our mosquitos are very small and are hardly noticed but as a note to remember, they do come around more at dusk which is when most people are out watching the sunset. You can get repellants for these of course at any convenience store which work quite well. One can also look into natural repellants which can be available in some locations. It is funny as some people are not bothered at all by them and others get multiple bites. We very much enjoyed out stay in 1592. Very comfortable bed and nicely appointed kitchen, (which we did not use except to make coffee). Easy entry with keypad lock. Lovely view of the ocean. High enough up to avoid ground level noise. Sturdy beach chairs and bag. Would have liked a washer and dryer, but understand those are not common in this building. Great condo with beautiful view. Clean and comfortable unit with fully equipped kitchen.Reasonably priced condo with good and easy management. Will come back again. I have just spent 16 days in condo 1592. I loved everything about it. It exceeded my expectations. The location is safe and very convenient, close to everything. The condo is well maintained, clean, very well equipped with all you may need, the view is amazing. The entry without a key or an entry card (numeric pad - you just need to remember four numbers) is very convenient. In case anything goes wrong, the owner provided information about the local contacts. The building has its own ever-present security guard. Wi-Fi works perfectly (when I arrived, I had trouble with the connection, so I called the local internet company - phone number provided by owner in the letter, the travellers receive; result: within 20 minutes - including being on initial hold - my connection was fixed). I would recommend this condo to everybody without a hesitation. We do appreciate taking the time in today’s busy world to post a review for us. We are always happy to hear that you enjoyed your stay and found everything to your liking. We really do try to make each stay a wonderful one. We are glad you found this unit to exceed your expectations and that you would recommend it to everyone. This condo has a great view of the marina and the Alo Moana Park. It was convient between the Alo Moana Mall, Convention Centre and Waikiki. With reasonable parking it made renting a car a good option to explore the island. Having ABC Store across the street also convenient for basic food and shopping. The condo was clean and everything worked including the air conditioning. We used the blender to make pineapple papaya smoothies. It was older than expected and they could add a few touches and updates but basically as shown. We would definitley use it again. We are glad to hear that you enjoyed your stay with us at the Ilikai Marina, unit 1592. It is a wonderful location and is very accessible to everything you need or want. The famous Waikiki Beach is a very short walk through the parking lot to Waikiki Beach and the Lagoon which making for great convenience. Our condos are all individually owned and therefore each owner with all different taste in furnishings and décor can make each condo an new experience and cannot guarantee an appel to each guest. We are happy that you did find all the accommodations that were needed. We are sorry that we do not provide a supply of coffee or tea as you would have hoped for but we do try to keep our prices in a very competitive range for our guests. We hope that you will stay with us again in your next visit in Paradise! Mahalo for your business. Comfortable condo with an excellent location and view! Good place to call "home"
As we arrived in the wee hours of the morning, it was so great to be able to enter our unit using a code, rather than trying to track down a key. This remained an appreciated feature of this rental, as we never had to worry about keys.The unit was clean and equipped with everything that we needed - especially in the kitchen. We were very comfortable. I like how the doors to the bathroom were situated, making it convenient to access at night without disturbing the sleep of others. Great view from the patio windows and only wish the patio was slightly larger to accommodate a small table. It is a little walk to the beach, nonetheless the location gives convenient access to many surrounding amenities and shops. Finally, I would also give props to the management company that handled the booking. They made sure that I had all the information that I needed. We so enjoyed our stay, the condo was spacious, clean, had everything we needed. We enjoyed having breakfast in and it save a lot on the dinning out. We enjoyed the beach, fireworks from lani and public transportation was right on corner, so we only used a car a day or two at most to drive around the island. Your value is comfortable and i hope u can get some discount with it, when you have a discount please email me. Your service is really good, there are knife and bowl everywhere. Location is good too!! Comfortable condo in great location with spectacular view. I found the condo very comfortable. The mattresses were supportive, even the one on the couch (futon) was thick and comfortable. I appreciated that there were beach towels and beach chairs in the unit. There was plenty of storage space. It was very nice to have a counter and mirror area outside the bathroom, so two people could get ready at the same time. And, of course, the view was outstanding. Sitting out on the balcony was delightful, and on Friday night we enjoyed the fireworks over the ocean next to the Hilton. Also, the other tenants in the building, many of whom are there for extended stays, were very friendly when I encountered them in the elevator. we like the location, and the room is ok.. coffee for the first day would be a nice touch.. and the itty-bitty TV with the tinny speakers us painful.. maybe spend 2 or 300 on something. everything was perfect, the appartament is very clean, well fornitured, close to the most beutiful beach, close to the shopping centre, restaurant and bike rental.the view on the marina in wonderfull specially at sunset! !thank you!! !I'll be back!!! We spent 10 days in Condo 1592. We looked out over the ala Wai Yacht Harbor, Ala Moana Park and the Hilton Lagoon, and the view was wonderful. The condo was very clean when we arrived. It was well stocked with dishes and appliances but the coffee pot does not have an automatic off which could prove to be very dangerous. The dishes were a mish-mash of patterns and colors, the pans cheap and well used. The towels were also very basic. It is close to ala Moana which is good as we had to buy more TP, paper towels, bar soap. While I don't mind doing that I would just as soon pay an extra couple of dollars a day to not have to do that (no car). There was no pool or access to pool. While the beach is just a short walk away I missed having a pool. It was a very quiet place to stay. We slept with the lanai doors open (a very tiny lanai). The only real negative complaint we had was the smokers. Even though it says no smoking on the lanai's in the rules there was smoking. One was another vacationer right next to us and that was the worst. Smoke came right in thru our lanai door (they left shortly after we arrived). There was another smoker who (I think) lived there. That was a constant but not as annoying as the one next door. Location was great for us as we have been to Oahu dozens of times and like to be away from mid-Waikiki. Walked to ala Moana daily. I would recommend: New dishes that match (dishes are not that expensive), coffee pot with auto off so someone doesn't start a fire, new pans, and towels that are a little bigger. Would I stay there again? Absolutely. A great value for where we were and the view we had. I loved the keyless lock! Instructions to get in were spot on. No problems there. Very close to watch the Marathon start. Close to Fort Derussy. Other than a false fire alarm and a march down 15 flights of steps, no glitches. The things I complained about are minor and would not deter me from staying there again. Close to everything, clean, great view and awesome sunsets. Saved a ton of money by cooking and eating in. Kitchen loaded with everything we needed. A perfect place. Nice condo, great views and location. We recently spent part of a week in Honolulu prior to a cruise. We wanted a condo that was on the edge of Waikiki with great access, less traffic and with great views of the ocean and beach. This condo fits all of the requirements. The property is in a beautiful location overlooking the harbor and the beach. Clean and updated. The onsite manager brought coffee filters immediately when we noticed that we didn't have any. Nice people work in the hotel. The lock system on the condo door was simple and it was great to not have to carry keys. We will certainly rent again from this group. We stayed for 5 nights in the this condo and it was wonderful. It was spacious for 2 people and the view was amazing. The location is very quiet as it is off the main street but also high up. The Chart House pub below is fantastic. The kitchen had everything we needed and the pin lock code was handy so we didn't have to carry around keys. We enjoyed walking along the beach in the afternoons. It's also only 10 mins to ala Moana Mall. The rental property manager, Kat, was helpful and available if needed. This condo was an absolute God-send because most hotel booking companies had assured my friends and that there's no possible way we could get a good hotel room by the ocean at such short notice during summer. We nevertheless decided to continue looking around until I landed on this condo through aloha condos and I was absolutely blown away when I was able to book the condo for the next day .The price was affordable considering it's location by the ocean. On Friday night there's a beautiful display of fireworks at the neighbouring lagoon that can be seen from the room. There were so many activities within walking distance from us like luaus ,parasailing and tonnes of good restaurants around. The best part was the sunset which was absolutely spectacular . The fact that we also didn't have to go through the whole hustle of checking in was an added bonus. Good location;bit expensive; poorly designed interior. What a view. Waking every morning to the glorious site of surfers at first dawn is magnificent. We enjoyed our stay in the condo. The condo is old but effort has been made to update and keep it fresh. The electrical plugs in the apt. were unreliable, except for the power bar attached to the small flat screen TV. Parking cost more than the rental car. However, we would stay there again as the rental agent gave prompt service, security was great, and location wonderful. We had a wonderful time in our condo, it has a picture perfect view. The accommodations were comfortable. I'm very happy that we rented the condo as it was great to feel like we were home, having our baby run around freely. Only drawback is that the balcony bars are very wide so I never left the glass door open in fear that my baby would get hurt. Other than that we had a lovely time, can't wait to go back! Condo was very clean and extremely well equipped. Location was perfect. I like to stay in this area and avoid the traffic on Kalakaua. What I liked best about our stay was the ease in coming and going. Also, the walkability is excellent. Wow! This is oceanfront! Amazing views.Stayed at the llikai Marina Condo #1592 for 5 nights. Loved it. Super easy Keypad access.Perfect location. Next to the Hilton Hawaiian Village (have stayed there before for twice the price and enjoyed it less! )and Modern Honolulu.Well stocked(beach chairs,towels)Deck is small but charming.Property manager Kat is in the area if needed.Tips: Catch the fireworks every Friday Night on Beach at Hilton! Before you pay at parking garage tell them how long you will be there and pre-pay cheaper. Avoid: Harbor Pub Pizza! We have just spent several nights at Ilikai Marina 1592, and found it to be as good as we had expected from the previous glowing Ta reports. The location half way between central Waikiki and ala Moana Shopping Centre (where we found the food court to be good value for quick food that was generally a level above what we are used to!) very convenient. The apartment faces the marina, with magnificant panoramic views out to sea. The condo is not new, and (as others have noted) the bathroom could do with updating. The kitchen is modern, though, and fully equipped, and the whole condo is spotlessly clean. One other thing particularly impressed me. I read a lot of Ta reports on this condo, and every so often people would comment on some minor flaws: things like not enough kitchen paper, uncomfortable bed, insufficient cooking utensils, for example. Each of these had been rectified, and I was gratified to find that the owner/manager is so aware and responsive. We enjoyed our stay in the condo. The condo had everything we need for a pleasent stay. Very clean and good location. Liked to have bath towels available. We met Kat, the property manager of 1592 in the hallway at the Ilikai Marina when we were staying at a different condo. After talking to her and communicating back and forth we decided to try one of her properties and we were very happy with the results. Very clean accommodations with great customer service and a million dollar view. The most important thing to us was the location. Most mornings with the sun on your back, looking towards the west skyline, we had rainbows! I can't tell you how many pictures I got of all the rainbows. And I can't tell you how many pictures I got of all the sunsets. Every night there is a different beautiful sunset. To top it off, there is also the spectacular Fireworks display every Friday night! People come from all over to watch it too. Families and tourists coming together to watch the Friday fireworks.We were so happy to be able to watch it from our private lanai and living room. We are coming back with a 100% certainty that we will be contacting Kat at Hawaii Vacation Properties llc and staying at the Ilikai Marina. That is for sure! We had a great time at the Ilikai Marina Condo. Our condo was beautifully decorated, clean, had everything and more than we had anticipated including beach towels and chairs! The view and location were the best we have ever had and the price was terrific. We will definitely try to stay there again. We checked in the condo very easily with all the details sent in advance. The condo was very clean and smelled good when we arrived. Very nice view and very well located. Unfortunately, we had a power outage in the building the evening we arrived, so we could not enjoy a walk outside. I don't think it's frequent though.The only negative things:-the laundry room was closed for repair for the 9 days we were there (arriving from the Big Island, we kinda counted on that). Also they put notices for renovations (carpet in the hallways) as well as regular maintenance. It would be good to know that in advance. It can be disturbing when you are on vacation.-Smell of smoking in the hallway and sometimes in the condo is a problem. We had to put something under the door, so the smell would not come in. We have received a letter when we were there and we had to phone the management office to ensure them that it was not coming from us.- at 2-3 am (Friday and Saturday), noises coming from people in the bar signing, screaming or arguing woke us up. All in all, we had a good stay there. The presentation of the condo was perfect as was the location.The location overlooking the marina was superb and very quiet (No road noise). Central to the famous Waikiki beach. A five minute walk to the Ala Moana shopping centre and 10 minutes to Waikiki. The information provided by Aloha Condos (Management) was timely and precise. Definitely recommended. everything as advertised, plus on site contacts were extremely helpful and pleasant to deal with on the wi-fi problem we had. My stay in Honolulu was even better than I had hoped. The accommodation and customer service were exemplary...well done! In addition to the gorgeous views from the balcony, this condo has some real advantages. Oahu has a fantastic bus system extending to all parts of the island. There are so many different bus lines leaving from outside the condo and at the nearby ala Moana Shopping Center that one can visit all parts of the island by easy bus transportation. We went to the Bus Pass Office at 811 Middle Street and got our senior bus pass photo card for $10. This card is good for three years. This card plus a $5 one month's sticker allows unlimited travel all over the island. The condo is in a perfect location for use of buses. The condo was clean, the bed comfortable and we had only a few concerns. There was a lack of certain items like tea kettle, steak knives and place mats for the dining table. We called and they were delivered within a few hours. One concern is the shortage of soap for the dishwasher and bathroom. We were given enough dishwasher soap to use the dishwasher only each 2-3 days. There are not enough dishes to go this long. So, we had to hand wash dishes. Also, there was no Kleenex. We took the Number 42 bus to Costco, walked to Wal-Mart and walked to the Foodland grocery store at ala Moana Shopping Center. Bus 19 and 20 go to the airport. We took buses to the north shore, east shore,Arizona memorial, and zoo. The bus marvelous web site is at www.thebus.org. We enjoyed walking around the small boat harbor, the Hilton lake next door and Magic Island, the peninsula to the right of the condo. Beaches there were very uncrowded compared to Waikiki. Relaxing vacation - lovely view from condo. - we love Hawaii!!! My husband and I visited Oahu for our first anniversary. We were originally planning on booking a hotel but the condos seemed like a better value for a week's stay. I'm really glad we went this route, it felt like our own home for a week. This place had everything we needed, full kitchen, beach gear (umbrella, towels, boogie board). Complimentary internet access made trip planning easy from our room. Everything was clean and comfortable which is extremely important to us. But the best part was the view over the marina. Beautiful sunsets! Be sure to get some fresh poke from the Foodland in the ala Moana shopping center, about a 10 minute walk max. Every Friday night, walk directly next door to the lagoon to see amazing fireworks directly over your head! We couldn't have picked a better location. Unit was clean, well appointed and stylish. Great view, good location and convenient parking. For groceries, shop at Safeway in Kapahulu. Our family wedding was a great experience. We especially enjoyed staying in the Ilikai Marina condo with its beautiful view of the Marina. It was comfortable, clean, reasonably priced and in a great location. What more can we say. the instructions were very clear we had no problem getting in the condo. as soon as we walked in everyone says wow this is nice and the view is perfect for the friday fireworks display and the sunset we very much appreciated we saw rainbow from our balcony. had no problem during our stays, the place was easy access to everything the bus, restaurant,shopping mall you name it. i will recommend this to everyone who's planning to go oahu.i give this condo excellent. Relaxing, easy vacation w/ beautiful view! Very comfortable and clean. Close to the beach and an easy walk or bus ride to Waikiki. The only things i would change would be to add a king size bed and coffe filters and more paper supplies(towels and TP) would have been nice. This place was quiet and had enough room for us and our girls to coexist comfortably. Abc store and grocery close by as well as many restaurants. Great specials at the pub downstairs! This condo has a great location, and an unbelievable view!But, some minor problems. The bath tub drain does not work so it is very difficult to take a bath; shower, though is fine.Wanted to cook in while there, but no quart cook pans; very few pans, so had to eat out all the time or do carry out. Kat, though, was great. She instantly provided help and answers to questions. It maybe a bit small if the party is more than 2, for us, it's just perfect size, very cozy, feels just like home. It was also very clean and tidy when we check-in. Though the interim cleaning is a bit expensive ($125), but they certainly did a good job. Check-in and check-out was very smooth. The local contact, Kat, was very helpful. We were able to look at the apartment when we made the reservation, so there was no surprise when we arrived. As our departure flight is at night, She is so kind to let us check-out a few hours later, so we didn't have to worry where to store our huge suitcases. The location is excellent, within walking distance to waikiki and ala moana beach. Escape from the crowd in Waikiki but still able to enjoy the restaurants there, perfect! We went swimming in the ala moana beach, which is only a few minutes walk from the apartment. We took the beach towels (which was provided), and off we went, it's like having the beach on site! Parking was not a problem. There were a few metered parking spots in front which charges $8 for whole night parking. I would certainly recommend this apartment and would want to stay there again if I get a chance. The location is good because it is easy to get to beaches, shopping, restaurants, etc. The view is what we stay here for. The yacht harbour, surfers, rowers, sailboats, walkers, joggers and cruise ships all can be seen from the lanai. We enjoyed seeing a whale just past the surfers and the Friday night fireworks were a nice touch. The condo needs some updating and the rug should be cleaned or replaced. The condo was beautiful and spacious and the value was good, too. Only the balcony was too small, but we were very happy that there was one. We liked the garage that was adjacent to our condo, so we had peace of mind when we rented a car. The fact that we had a double bed instead of a queen bed was not an issue for us. We would recommend though that the bathtub and the shower head need to be changed as they are very old and they show it. We liked that there was a phone in the condo, so it was convenient for us to book our trips. The kitchen was so well equipped that we were able to take our breakfast in our condo. We were a bit annoyed though every morning by the noise that was coming from the street in front of the marina despite the fact we were on the 15th floor. The condo was clean, but I was a bit disappointed when I tried to move the bed a little and the carpet under the bed looked like it was never vacuumed. The check-in was pretty adventurous, as I happened to check-in alone since my husband went directly from the airport to the conference, so it was not an easy thing for me to do with all the luggage and the papers in hand reading how to find the key. Of course, I managed to get to our condo and find the key in the locker on the door and I felt very proud. The location was very good as we were just in front of the marina and the view from our condo was amazing. The only disadvantage was that it was located on the far end of the Waikiki Beach area and we had to walk a lot each time we wanted to go where the action was. It was good as an exercise, but in the evening when I was wearing high heels, my feet complained a lot. The service was excellent as we received all the emails with all the instructions on time and there were no misunderstandings or hidden fees, etc. Generally, what we liked best was the ocean view from our condo and what we liked least was the very old bathtub and shower head. We would definitely recommend this vacation rental to anyone. The sunset views were amazing and you can't beat the location to watch the fireworks on Friday night. Great to have use of a kitchen and the living room and bedroom were very comfortable. Also nice to have internet access for work. The location was a very short walk to the west end of Waikiki Beach or a short walk to ala Moana Park (or ala Moana shopping mall). So in the middle of a lot, but quieter than the middle of Waikiki. My only suggestion for improvement is the bathroom, it is outdated and the florescent light is harsh. But it is clean and perfectly functional. I would definitely stay there again. Excellent value for the money paid and amazing view! The condo was an excellent value overall. The price beat anything else near the beach on Waikiki, and the view was amazing! Watching the sunrise from the condo was something I won't forget. It is on the "quieter" end of Waikiki and you will have to drive to get to the busier parts of the beach (e.g. Duke's), but for a family with two young children, that was just fine with us! My only complaints are that the building is clearly in the middle of a renovation, as the halls were bare and the carpet in the halls was pretty filthy. Also, the shower seemed a little dated and sketchy, and the sheets on the bed were really scratchy. Aside from that, the rest of the condo was very clean and comfortable and I was quite satisfied overall. Entering the condo the scene had been set. The blinds were pulled back from the double glass windows and the view took my breath away. It was better than the photos and my expectations had more than been met. I had picked this property for the view and was also delighted with its position.It was quiet at night and was within walking distance of ala Moana shopping centre, the Hilton and restaurants.The condo was very clean and I liked the fact that washing up liquid, dishwasher tablets, coffee and an in fridge ice machine was supplied.The instructions given by Kat were perfect and so very helpful as was the extra key. Thankyou for the shopping bag and pen...very thoughtful. The bed was very comfortable and the a/C effective. There is a coin operated laundry on the eighth floor which is very clean, near the elevators and with no queues! We used the car park and paid ahead as suggested.Tip:Alamo is across the road behind McDonalds for picking up or dropping off a rental car. I was told they had an area on one of the floors in the Ilikai Marina parking area. They also drove us to the pier.Pros:amazing views, very clean, quiet, great position for shopping, easy access walking or driving and near many restaurants and aBC stores. The condo definitely was like being at home! Everything was very convenient and comfortable! Being able to walk to the beach each day and watching the sunset from our lanai were great bonuses!! I would recommend a portable fan in the condo, we bought one and left it there for the next vacationers :) The bedroom and bathroom just needed that extra little air circulation. We would definitely come back to Ilikai 1592!! We would recommend this unit to all of our friends and family!! Pros: Location was excellent with gorgeous views,Waikiki a short walk to the east, Ala Moana park a short walk to the west. Price. Very friendly management.Cons: Parking was very expensive and not disclosed until after we paid for the condo. Lanai was very small. This condo was perfect! Great location and totally comfortable. Bed was so comfy I slept like a rock every night. I would definitely rent this condo again. I picked out this room because its room rate seemed pretty reasonable compared to other hotel/condo rooms with ocean view. I believe my choice was right. Once you enter the room, you will be dazzled by the panoramic view from windows. Sky, clouds, ocean, yachts and boats, palm trees, sunset, night view... If you stay over on Friday, do not miss the fire works of Hilton. This room is located at the best position to see them. The nighborhood is not as crowded as the central district of Waikiki, yet is convenient enough. Most of the things (including groceries) are available at an aBC store just around the corner, and ala Moana Shopping Center is in a walking distance also. Beaches are in walking distance, too. The building and room facilities are not modern, but sufficed enough for me. Actually, I felt more relaxed in this room than in usual hotel rooms. Even though there was no front desk, no conceirge desk, I did not feel any difficulty. Things are as well organized as per instructions. And, Kat, the local support, was friendly and very helpful. I could not find a hair dryer on arrival, and then she brought one to me shortly after I called her. Those who want a vacation in luxury may go for another accommodation of higher room rate, but the priceless superb view from this room may be still worth consideration. The view from the condo is beautiful from watching whales jump in the bay to the sunsets at night. The condo had plenty of room for a family of 4. The locations is far enough away from the hustle and bustle of Waikiki but close enough for our teenagers to enjoy, only a 10 minute walk and you are in the middle of it all. Kat was very helpful with any issues that we had and found a solution right away. The television was not working when we arrived, she had another one there the next day. The only negative we found was having to pay for the parking 17.00 a day. Even with that said all of the employees at the condo were very friendly!